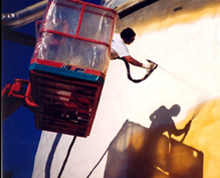 has a high degree of experience with polyurea coating for exceptional primary and secondary containment systems. Primary containment coatings are fully immersed or in direct contact with the materials in storage. Secondary containment is considered the back-up containment system for temporary splash or spillage. Together, primary and secondary containment systems create a strong barrier to prevent leakage and contamination of the surrounding environment. perforations and crevices, it provides a impenetrable seal to protect against the corrosion from all types of liquids, chemicals and gases found in a sanitation and sewage environment. While the oil and gas industry is not new, transportation and storage of fossil fuels has become highly regulated. An aging infrastructure indicates that the potential for oil and gas (pipeline and storage tank) leaks is on the rise. Polyurea’s elastomeric and chemical resistant properties make it ideal for the rehabilitation of older tanks and the material of choice for new fuel storage tanks. It is completely non-reactive with most fuel types and provides excellent protection from rust, corrosion and abrasion. 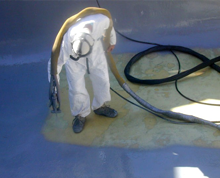 Secondary containment applications provide a seamless coating for maximum leak protection. United States regulatory organizations constitute that all hazardous waste in underground or above ground storage tanks must provide secondary containment solutions. Various formulations of polyurea meet even the strictest governmental regulations by providing a monolithic seal that seamlessly adheres to the substrate. 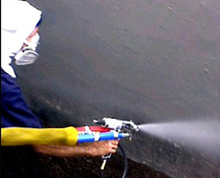 Polyurea is impervious to temperature change or chemicals and provides the necessary protection to allow proper cleanup without damage to the environment. High purity materials used in the specialized manufacturing, production, and other industries require storage that prevents leakage but, more importantly, protects the integrity of the stored material. The invulnerable nature of polyurea delivers a chemical resistant, corrosion proof answer for the transportation and storage of high purity materials. Unlike more traditional coating methods, polyurea’s high dielectric strength delivers a safeguard against contamination from decomposition or outgassing of the coating itself. Polyurea’s resistance to a broad-range of chemicals makes it perfect for the preservation of the integrity of high purity materials. Containment for coal, cement, plastic pellets etc.